What is Nowruz ? What is the meaning behind the haft sin? Nowrūz ( نوروز‎ ) (New Day) is the name of the Iranian New year in the Persian calendar. Nowruz is also referred to as the "Persian New Year". The term Nowruz in writing first appeared in Persian records in the 2nd century AD, but it was also an important day during the time of the Achaemenids (c. 550–330 BCE), where kings from different nations under the Persian empire used to bring gifts to the Emperor, also called King of Kings (Shahanshah), of Persia on Nowruz. 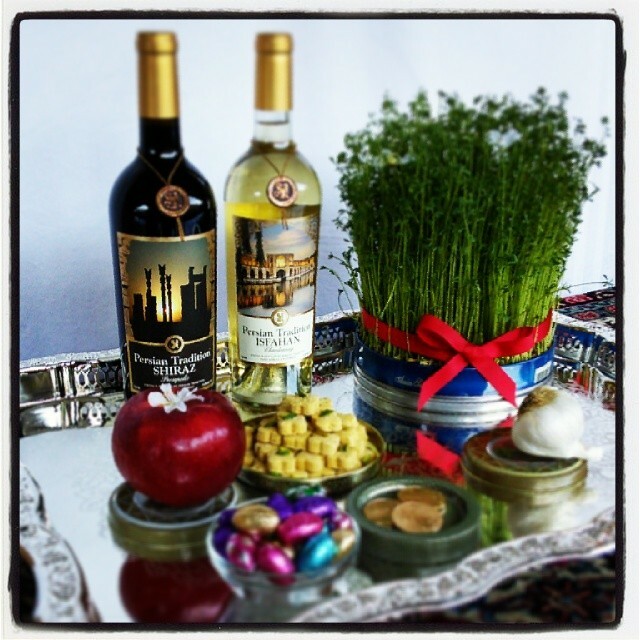 How better to celebrate Nowruz; than with friends and Persian Tradition wine. My search for the meaning behind the haft sin table started years ago when I asked myself a simple question: If haft sin refers to “haft” (the number seven), and “sin” (the Persian letter “S”) why are there more than seven items on the table and why don’t many of their names start with “S?” What is the extra stuff? And, why set this table as part of the Nowruz (Persian New Year) celebration which happens at the Spring equinox each year)? I asked friends, family, learned people… and basically got back a variety of explanations that always followed the same internally inconsistent plotline, which goes something like this: The haft sin, comes from “haft shin”, which means “haft” (or seven) and “shin” or the Persian letter “Sh”… Somehow, through the passage of time and for reasons entirely unknown to everyone who recites this story, the “shin” has changed to “sin” and now we have the haft sin, which again refers to the “haft” (or seven), but this time to “sin”, or the Persian letter, “S”. Unfortunately, even though everyone seems to agree on this explanation, this story is ridiculous on the face of it. After all, everyone knows and acknowledges that there are several essential symbols that must be on every haft sin table, but that don’t start with a “sin.” Notebly, these symbols are Sham (candle), Ayeneh (mirror), Mahee (fish), and Tokhmeh Morgh (Eggs). The symbols break down into three from the material world (or “donyaheh mahdoodiat”), three from the conceptual world (or “donayeh maanah”), and one that sits between and ties the two worlds together. How does one do that? Well, that’s where the whole thing ties into the celebration of Nowruz, which is all about renewal and the start of Spring. The haft sin is a symbolic reminder of the constant renewal (or rebirth) that can happen when one transcends and balances the material (mind), with the immaterial (spirit), by letting life flow through oneself in a perpetual state of acceptance, amazement and appreciation of each moment as it happens. I can say however, that whatever their purpose and meaning, these other items most certainly don’t distract me from the symbolic coherence of what the seven essential symbols on the haft sin represent and how they have finally allowed me to appreciate this wonderful tradition in a way that makes complete sense to me and makes my heart jump for joy at the prospect of a life lived as a perpetual celebration of being in the moment, or Nowruz!